J.R. Wirth is a native of Southern California. Raised in Azusa, he now hails from San Bernardino. J.R. is recognized for his extensive work in the helping field. He is a licensed psychotherapist with a long list of accomplishments, including a 15-year stretch as a domestic violence counselor and trainer, and head of a disaster response team. J.R. had a stint as a university professor, and even spent time as a child abuse investigator. Through all these duties, he continues to provide clinical supervision to young, aspiring therapists. J.R. currently supervises the therapy portion of a forensic psychiatric unit in Southern California. 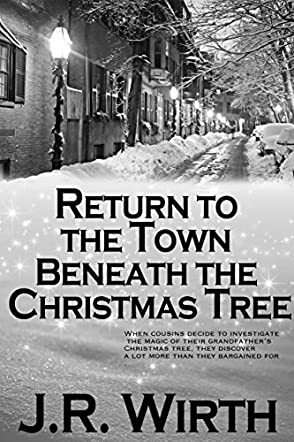 Return to the Town Beneath the Christmas Tree: Twisted Family Holidays is a holiday-themed novella for young adults and preteens written by J.R. Wirth. While this year’s Christmas cheer was still subdued in a big way by the deaths of Jacob and his mom, there was something about the mere fact that Grandpa got the ornaments out and that the tree was decorated that started the kids all thinking about things. The tree was magical, there was no denying it; after all there was a town beneath it where things happened. But how could that be? Isaiah and Hailey were determined to find out. Their first step was to actually determine where the tree came from and, from there, to discover when it had become magical. Isaiah had his driver’s license now, so they figured a trip to Walmart would be a good start -- after all, they got most of their stuff from Walmart, so Grandpa may have bought the tree there as well. They started looking at the places that sold trees, but the sheer multitude of choices had them deciding instead to check out the closest Walmart warehouse. What they found there was magical indeed. J.R. Wirth’s holiday-themed fantasy novella for young adults and preteens, Return to the Town Beneath the Christmas Tree: Twisted Family Holidays, is an intriguing addition to the pantheon of Christmas-themed tales with Walmart and the North Pole seeming to share certain significant characteristics being an unusual twist indeed. While there are stories that precede this offering in Wirth’s Twisted Family Holidays series, the author provides enough background information for the vigilant reader to get involved in Isaiah and Hailey’s quest to track down the magical source. His characters are well-defined, the plot is fast-paced and exciting, and the author’s message is very relevant. Return to the Town Beneath the Christmas Tree: Twisted Family Holidays is highly recommended. When is he going to write more books love this one is ever going to do Halloween or other holidays.please write more .